The peaceful Olive House was designed and built in 2005 by a renowned Athenian architect on the popular island of Paros in the Cyclades. 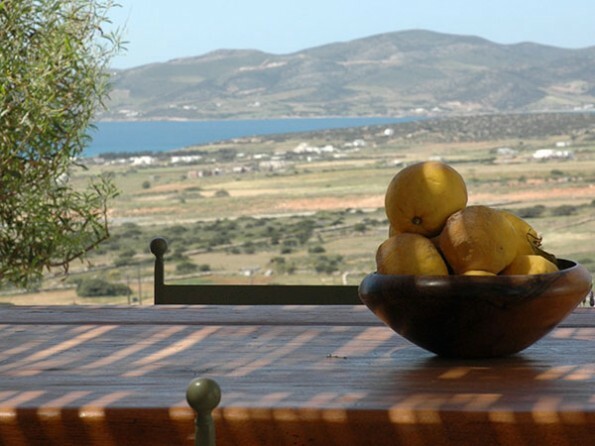 This stunning house is set into a hillside with sweeping views of rolling fields, the islet of Antiparos and the open Greek sea. The villa combines the best of Greek traditional living with super-comfy modern conveniences, and the terraced hillside is filled by an abundant flowering garden. The three-bedroom villa, located approximately 5 km northeast of the seaside fishing village of Alyki, was designed as a classic island home with contemporary flair and comfortably sleeps six. Light and airy, the house has an inviting open floor plan, and is surrounded by wrap-around terraces. The space flows beautifully from the verandas with their various dining and lounging areas, to the interior shared living spaces and bedrooms. The huge veranda facing the sea is easily accessible from all of the rooms connecting to it, and the interior is kitted out with all of the modern conveniences from wifi to top-notch kitchen appliances and air conditioning and heating. Beyond the obvious delights of the sea and sun, visitors will discover rich historical treasures, a diversity of art galleries, and excellent locally produced food and wine. You are well positioned both to indulge in a glorious, relaxing holiday and also immerse yourself in art and culture. The Aegean Center for the Fine Arts offers workshops, seminars, and study abroad programmes. For those eager to venture further afield, ferries to neighboring islands operate regularly throughout the high season. The islands of Antiparos, Naxos, Mykonos, and Tinos in particular are only a short boat ride away and can easily be seen in a day trip. Visitors can reach Paros by sea (3½ hrs by high speed ferry from Piraeus port near Athens or much shorter from other Cycladic islands) or air (25 min flight from Athens). Because of the privacy of the home, it is necessary to rent a car during your time with us. We can arrange a rental car for you or point you in the direction of the right agency to speak with. The Olive House is a five-minute drive from the Paros airport and approximately a 25-minute drive from the island's capital city and port, Parikia. Paros is roughly 70 km long, and the island's main ring road covers approximately 120 km of coastline. With three bedrooms and three full baths, the Olive House sleeps six very comfortably. Cribs and toddler beds can be provided upon request. – the house is very family-friendly. In a pinch, the villa can accommodate eight or nine guests – as additional sleeping space is available on mattress-style sofas in the sunken living room. The master suite offers a luxurious oversized bathroom with a soaking tub for two and breathtaking views of the sea. The furniture at Olive House is a mixture of comfortable modern pieces and carefully chosen antiques. The house has a fully equipped modern kitchen and an indoor dining table to seat eight. Some of the Olive House amenities include: a flat-screen television, wireless internet access, Bose iPod speaker dock, espresso maker, washer and dryer, built-in barbeque, fireplace, outdoor shower, carport and in-room air conditioning and heating. Visitors will enjoy the special privilege of being received at the port by Ramona, our on-island concierge and a native of Paros. 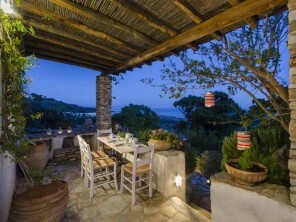 She will introduce you to the house and share with you her knowledge of the sights and secrets of Paros. Although you will have complete privacy during your stay, assistance or advice will only be a phone call away. Our aim is to make you as comfortable as we can, while also granting you access to real Greek island life. Guests who visit during the fall season will be invited to assist with olive picking and grape harvest. As your hosts, we are eager to serve the individual needs of our guests and make you feel at home. To that end, we stock the house with Korres natural bath products, filtered drinking water, wine, beer, soda, coffee, tea, fresh fruit, cheese and bread upon arrival. Firewood is also provided during the colder seasons. We provide once weekly maid service as part of the rental fee. Daily service can be organized for an additional fee. Minimum seven night stay. Discounted 15% for bookings of three weeks or longer. These prices include utilities (water and electricity) and weekly maid service. Upon request, we are happy to furnish our guests with additional grocery items, or arrange for more frequent housekeeping, for a fee. Half of the rental fee is due on booking as a deposit. The second installment of rent is due 60 days prior to your arrival at the property. Adherence to this payment schedule guarantees your reservation in full. Ten percent of the total rental fee is non-refundable. In the event of a cancellation, your deposit (less the 10 percent) will be refunded if we are notified 60 days in advance. A refundable security deposit of 500 euros is due with your second installment of rent. Olive House is certified by the Greek National Tourism Organization: EOT number 1175K92000976701.